When your business starts to expand and it's inevitable that you're going to use more labels, you need a quicker, cheaper method to print. Rolls provide an easy way to print the exact number of labels you need, when you need them. 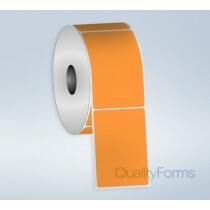 Quality Forms paper thermal transfer labels are top coated for high quality printing and for use where a ribbon is required. These labels come in white with permanent adhesive. 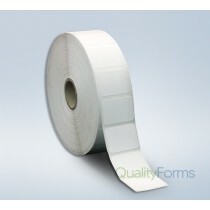 Thermal labels are ideal for shipping labels, barcodes, identification labels, price labels and more. This print quality is very high; the image is long lasting and durable. Thermal transfer printing is the most widely used method for bar code label printing. Browse through our labels below and receive a quality product combined with excellent cost savings. Use Thermal Transfer labels for high volume quality printing in black or in color!